Over on CD Sunday the challenge this week is O for Olympics. I may just get this card into the challenge on time! The card was made with MCS, the finishing line. Glad you managed to gt your card done in time Colleen, great card and I totally forgot I had this cd when I needed a cycling card recently. Hi Colleen. A Happy New year to you and it is good to see you again. I like the manly colours that you have used and the grass at the bottom is particularly effective. 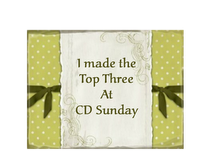 Thank you for joining in with us at Cd Sunday. Hi Colleen. Glad you managed to join us in time for this week's challenge. I'm a bit late posting as I'm full of cold - yuk! Hi Colleen, A Happy New Year to you and pleased that you got your card done for our challenge this week. Super image (maybe biased-hubby a cyclist)and like Jenny has said, now I know where to find a cycling image. Thanks for joining us at CD Sunday this week and good luck in the draw.